What does the Church really think about modesty? I mean, what is all the fuss really about this word "MODESTY"? When I wrote my book, "Immodesty, Satan's Virtue" in 1999 I never would have thought nearly 20 years later this topic would have exploded the way it has. Never has there been a time that this message was not MORE needed. A time when women have forgotten who they are, and men have all but abandoned their posts. This is a topic I have a great passion to get out to women who have never heard about modesty and what the Church says about it. As one reader said to me the other day, "I only wish I had read this sooner!" Now as my FREE GIFT to you, "21 QUOTES on Real Catholic Modesty" covers from the Bible, Saints, Popes and more showing us the path to understanding timeless modesty for today. 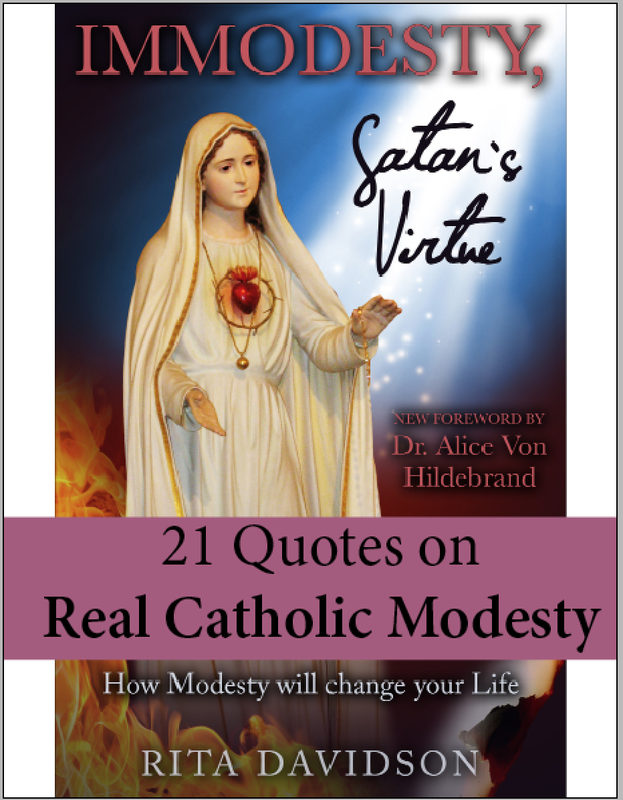 "21 Quotes on Real Catholic Modesty" is Appendix Two, an excerpt from my book, "Immodesty, Satan's Virtue". For those just wanting a SNEAK PEAK here it is. I know these quotes will give you much food for thought. I know they will stir up questions that have been waiting. And I pray they make you hungry to understand this complex issue more. LIMITED TIME OFFER - It's FREE - No Strings attached. ©Copyright 2017 Rita Davidson & Little Flowers Family Press All Rights Reserved.